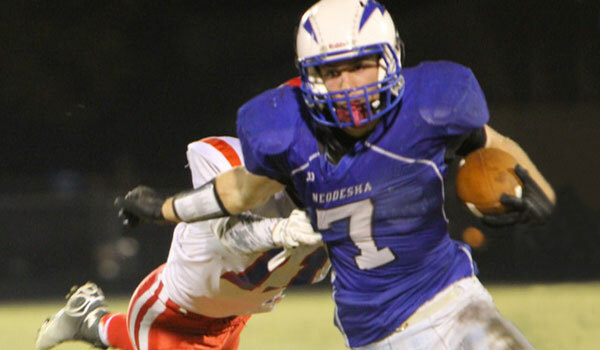 Mason Berryman and the Neodesha Blue Streaks take on Galena in the 3A first round (Pamela Black). Both Sabetha and Nemaha Central enter with a 7-2 overall record and both are coming off shutout victories. However, it was Nemaha Central that came away with a 35-27 win over Sabetha in week one. The rematch is set for the first round of the class 3A playoffs. Sabetha won its district with three lopsided victories and ride a six game winning streak. The Blue Jays beat Riverside 33-12, Horton 34-7, and Hiawatha 53-0 during district play. Sabetha is a run heavy football team, rushing for 2,967 yards as a team with 41 rushing touchdowns. The keys to victory are simple, control the time of possession and the line of scrimmage. Nemaha Central looks for a repeat performance and advance to the second round of the playoffs for the second straight season. The Thunder took second in their district after dropping a game to Centralia 35-6, defeating Rock Creek 28-9, and routing St. Mary’s 43-0. Nemaha Central’s defense has been it strong point this season by posting two shutouts and allowing 12 points or fewer on five different occasions this season. In the first meeting between the two teams, it was Nemaha Central that outgained Sabetha on the ground, 224 yards to 109 yards, which proved to be the biggest difference in the game. Both teams favor the run over the pass, and whichever team can control the line of scrimmage from the start will come out on top. It appears to be two evenly matched teams, in a rivalry game to open the class 3A playoffs. I’ll give a slight edge to the home team. Galena will host Neodesha in the opening round of the class 3A state football playoffs on Tuesday night. Although at 5-4 on the season, the Bulldogs were crowned district champions after defeating Cherryvale 36-21, Southeast-Cherokee 34-8, and Riverton 43-37 in a back-and-forth contest. In three of the four Galena losses, the Bulldogs have lost by a combined 17 points. Two of those losses came to two teams that are currently ranked in the Top-5 of class 4A-II. Their strength of schedule will benefit them come Tuesday night. Neodesha enters the first-round matchup with a 7-2 overall record and is coming off a 43-18 win over Eureka to close out district play. The Blue Streaks won six of their first seven games but lost to Caney Valley 35-20 in week eight to take second in their district. The Cherryvale Chargers were the one common opponent between Galena and Neodesha. The Bulldogs put up 36 points in their win over the Chargers, whereas the Blue Streaks struggled to find the end zone in its 20-14 loss. Expect the more physical team to win this matchup. The Riley County Falcons opened the season with a 1-3 record but have rebounded to win four of their past five games. Riley County opened district competition with a 41-32 loss to Washington County, but defeated Minneapolis and Marysville to earn a spot in the playoffs. Sophomore running back Garrett Staten leads the Riley County offense with 895 yards rushing and 16 touchdowns on 172 carries. Quarterback Brice Brummett has passed for more than 500 yards and has rushed for more than 300. Jackson Wagner is the leading receiver with 20 catches for 373 yards and two touchdowns. The Norton Bluejays have pitched three shutouts and kept opponents to seven points or fewer in seven of nine games. Senior Jared Tallent leads Norton with more than 877 yards rushing and 10 touchdowns on 117 carries. Seniors Kobie Unterseher and Deon Lyle each have more than 250 yards receiving. Sophomore Jacob Green leads Norton with 70 tackles, including 20 for loss. Senior Kendall Miller has seven sacks and Lyle has posted six interceptions. Two programs loaded with tradition are ready to battle in the first round of the playoffs. The Conway Springs Cardinals opened the season 8-0 before dropping their first game 29-17 at Chaparral on Thursday. Luke Fisher leads a Conway Springs offense that has scored at least 35 points in seven of nine games. Fourth-ranked Wichita Collegiate’s only loss came 34-28 to Class 4A Division II’s top-ranked Andale in Week 3. The Spartans won all three of their districts games by 53 points or more. Collegiate junior quarterback Austin Waddell has passed for more than 600 yards and rushed for almost 300. Senior Jacques Williams has rushed for more than 1,000 yards and 23 touchdowns.